THE B-MOVIE NEWS VAULT: More Than One Wears the Mask in the Spectacular SPIDER-MAN: ENTER THE SPIDER-VERSE! More Than One Wears the Mask in the Spectacular SPIDER-MAN: ENTER THE SPIDER-VERSE! OWN ONE OF THE GREATEST SUPERHERO FILMS OF ALL TIME ON BLU-RAY OR 4K ULTRA HD BLU-RAY DISC! I so very much wanted to see this film on the big screen last year, but never made it. I finally did get to see it last week and WOW.... is it amazing! SPIDER-MAN: INTO THE SPIDER-VERSE is a dream film for fans of the character, and delivers a great story with an awesome voice-cast, wonderful animation, and a lot of heart! This Spider-Man adventure comes highly recommended Vault Dwellers, and I can't wait to add it to my collection! Synopsis: When the Kingpin's experimental collider tears the fabric of multiple realities, young Miles Morales crosses paths with Webheads from other dimensions! 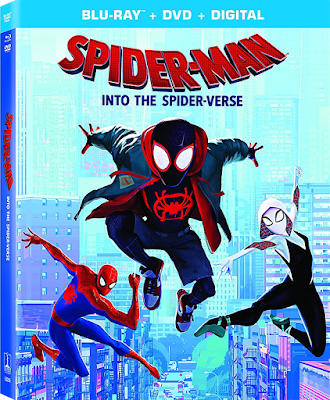 With the aid of Spider-Man (Jake Johnson), Spider-Gwen (Hailee Steinfeld), Spider-Man Noir (Nicholas Cage), Peni Parker (Kimiko Glenn), and the cartoonish Spider-Ham (John Mulaney), Miles learns what it means to be hero, and steps up to save his reality and return his newfound friends to their own! "Sunflower" by Post Malone and Swae Lee. All-New Original Short "Spider-Ham: Caught In a Ham" - It's another normal day for Peter Porker, a.k.a. the Spectacular Spider-Ham, fighting bad guys and loving hot dogs, until a mysterious portal starts messing with the very fabric of his cartoon reality. SPIDER-MAN: INTO THE SPIDER-VERSE is now available on all home video formats and should be $23 on Blu-ray and $28 on 4K UHD! If you're a fan of superhero cinema (especially Spidey!) 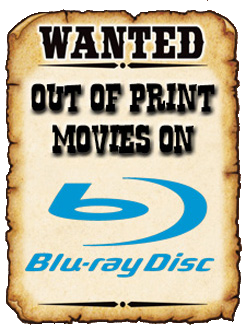 order a copy today from AMAZON (DVD / BLU-RAY / 4K UHD) or BULL MOOSE (DVD / BLU-RAY / 4K UHD)!